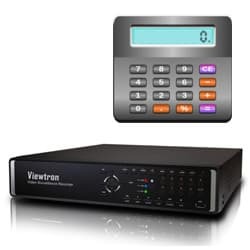 This online hard drive calculator is used to plan hard drive size and Internet bandwidth speed requirements for Viewtron HD surveillance DVRs and hybrid HD-SDI / CCTV DVRs. The calculator allows users to input the number of HD-SDI cameras and CCTV cameras being planned for use at a video surveillance system installation. Users specify the number of HD cameras, number of CCTV cameras, resolution, frame rate (FPS), and image quality setting that will be used and the calculator lets the users know the required hard drive size for one minute, one hour, one day, and one month of recording. The required bandwidth specifies the upload speed required of the Internet connection that the DVR will be connected to. This calculator is also available in the CCTV Camera Pros mobile app for iPhone, iPad, and Android devices in CCTV Camera Pros mobile app. The mobile app makes it easy for installers to take all of our online tools with them anywhere. If you find this tool useful, please bookmark and share. NOTE: To be safe, users should add an additional 5-10% of hard drive space. Copyright © 2013 CCTV Camera Pros, LLC. All Rights Reserved.